Tatra Safety Boots & Shoes Inc, manufactures and distributes steel toe safety footwear for men and women. Looking for a steel toe work boot built for comfort, durability and reliability at a completive price? You've landed on one of the web's leading online Canadian footwear distribution stores. Tatra Safety Boots & Shoes Inc is not just a distributor we are manufacturers of high quality footwear. We can provide workers with the highest level of protection, meeting or exceeding CSA and ASTM Standards. We’ve been servicing and custom designing footwear in Canada for the construction industry since 1932. If you are working in the construction industry you know how important it is to build something right. We at Tatra have the same philosophy, if you are going to manufacture a shoe you just don't want to develop it to fit the foot, you also want it comfortable, reliable and durable is our motto. We can accomplish this because we use the highest quality control standards. What type of steel toe work boot or shoe can you offer me? We can offer you the casual shoe, a dressy high boot or the more rugged looking construction work boot. Tatra manufactures High Heat Work Boots that are vulcanized nitrile rubber outsole heat, oil & acid resistant lug pattern, with steel toe. Our other safety products include, Foundry Boots, Internal Metatarsal, and the External Metatarsal Protection. For those of you that want a little western class be sure to check out our Westerns & Wellingtons series. We haven't forgot about the ladies, we have a sections for Ladies Steel Toe Work Shoes. How do you cut your shoes and produce so many? Visit our shoe cutting page. What sort of options can your shoes or boots come with? Here are just a few. Please visit our custom work boots options page to see the complete list. Remember to contact us if you require manufacturing of custom work boots. What areas do you supply your safety work boots to? 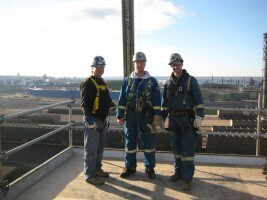 Tatra supplies our safety footwear right across Canada and the United States. With our factory based in Dunnville, Ontario we have been very proud to offer our services to our local customers in Hamilton, Ancaster, Burlington, Stoney Creek, Toronto, Oakville and the other surrounding cities. Let Tatra be your footwear distributor of choice. We’re sure after you try on our footwear products it will be the perfect fit. Remember be good to your feet and they'll be good to you. Purchase safety boots and safety shoes at our online store. 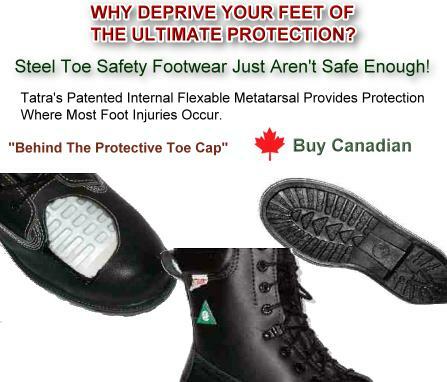 The Ultimate in Canadian safety metatarsal footwear products. Steel toe work boots and shoes. Buy your safety work boots and safety shoes at our secure online warehouse today! Remember to comeback and watch for our sales and promotions. Quality safety metatarsal footwear, steel toe work boots and shoes. Copyright © 2008 Tatra Safety Boots & Shoes Inc.